Mary E. (Murphy) Sadowski, 88, of Worcester, died peacefully Saturday, January 6, 2018, at the Saint Francis Home surrounded by her family. Her husband of 59 years, Edwin J. Sadowski, died in 2014. 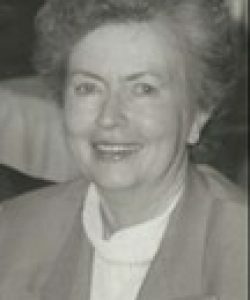 She leaves four children, Catherine M. Joyce and her husband Francis Joyce of Worcester, Walter J. Sadowski of Nantucket, Susan M. Legacy and her husband Raymond Legacy of Worcester, and James A. Sadowski and his wife Christine of Rutland; eight grandchildren, Kevin and Sean Joyce, Julia and Victoria Sadowski, Andrew and Mary-Kate Legacy, and James and Jacqueline Sadowski; a great granddaughter Norah Savini; a sister-in-law, Margaret Murphy of Shaker Heights, Ohio; and many nieces and nephews. Her brother Michael J. Murphy died in 2016. Mary was born in Worcester, the daughter of James P. and Catherine A. (Hendry) Murphy, and lived in Worcester all her life. Mary was an office clerk at Saint Vincent Hospital, where she worked for 35 years, retiring in 1996. Mary loved to read and greatly enjoyed the time spent with her family, especially her grandchildren. Mary’s family wishes to thank the fourth floor staff at Saint Francis Home for the skilled and compassionate care they provided her. Calling hours are Tuesday, January 9, from 5 to 7 p.m. at the Athy Memorial Home, 111 Lancaster St., Worcester. The funeral will be Wednesday, January 10, from the funeral home with a Mass at 11 a.m. in Immaculate Conception Church, 353 Grove St., Worcester. Burial in Worcester County Memorial Park, Paxton, will be private. In lieu of flowers, memorial donations may be made to the Alzheimer’s Association , 309 Waverley Oaks Road, Waltham, MA 02452; or to Notre Dame Hospice, 555 Plantation St., Worcester, MA 01605.